If your part of the aristocracy that made Foxin Wins the devilishly good 5 reel that it is today then you will also love Lord Fox’s latest venture. Uncover the cards and play along with your favourite dapper fox in this lucrative scratch card cash cow. NextGen Gaming impress players with each new release added to their diverse and high-quality portfolio. Their dedication to delivering the best slot experiences packed with Bonus Features and plenty of chances to win is what they take most pride in, besides maybe the creative graphics and themes. 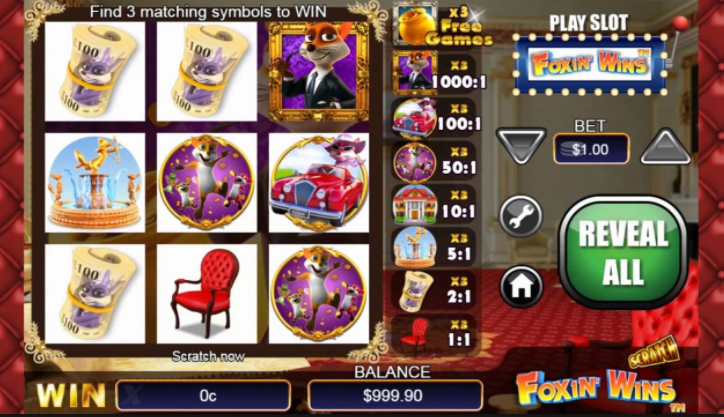 Foxin’ Wins Scratch is a different take on the original and beloved Foxin’ Wins slot game, keeping the characters and design, but transforming it into a thrilling online Scratch Cards game. Whether you’ve encountered Mr. Fox before or not, he can’t wait to invite you into his ridiculously expensive mansion, to show off all of his valuables. Luxury is the key word in Mr. Fox’s life, and it will be in your life too, if you follow his example. Stacks of money, cars, complex fountains- he’s got it all on display for you to admire and draw inspiration from. He’s also a generous fox, and will gladly give you some of his fortune if you catch the lucky tickets. An online Scratch Cards Game is based on the real-life action of buying a scratch ticket, only it’s more fun due to the themes and effects. The rules are basically the same, thought. Firstly, you buy a ticket, which is represented by the 9 cards that create the smug image of Mr. Fox, standing next to one of his pots full of golden coins. Don’t get jealous, though, because those coins can become yours quite easily. The symbols underneath are ready for you to scratch the cards and uncover them. You can click on every individual card, while enjoying the suspense of not knowing what you won until the very last one, or if you think that sounds rather boring, and you prefer a quick and effortless win, you can just click on the magic wand button and all will be revealed at once, making it a fun experience with no worries whatsoever. Collecting prizes couldn’t be simpler, as all you have to do is get 3 symbols of one kind on the same ticket, no matter their order. The prizes range from 1x your bet for the highly comfortable red seat symbol, to an impressive 1000x your bet for Mr. Fox’s portrait. Moreover, there is a Bonus Free Ticket to be won if you scratch 3 Golden Pot symbols. The gameplay is straight-forward and the design is user friendly, so there aren’t too many buttons to get lost in. In fact, you click the same button to buy a ticket and reveal the symbols. All the symbols and their respective prizes are easily seen on the right of the ticket, so you know what to expect and wish for. If quick and effortless winning sounds good to you, Foxin’ Wins Scratch will become of your favourite games. Foxin’ Wins Scratch is a visually satisfying online scratch card game that will impress you with its gameplay’s simplicity. Anybody can give it a try, especially if they’ve already met Mr. Fox and seen how generous he can be.